When I first heard about Sister Mary Margaret McKenzie’s idea to start a 12-Step Group to deal with the corrosive effects of white privilege on her life and on others, I was skeptical. I’ve been going to 12-Step meetings for Alcoholics Anonymous (AA) for more than 15 years, and I couldn’t quite see how this would work. I thought AA’s goal was simple: to help people abstain from drugs and alcohol. In contrast, such a group for white privilege could turn into a debating society – edgy, angry, and defensive. But the more I thought about it, the more I understood that those 12 steps are a blueprint to living a spiritual life of honesty, humility, integrity, and charity. And that’s what Sr. Mary Margaret’s life and the lives of her Visitation Sisters have been about for almost 30 years in north Minneapolis. Besides, this was Sr. Mary Margaret asking, and she’s been an elder, a mentor, an adviser, and a spiritual mother to me since we first met in 1989. When I’m down on one knee sucking for air, I run to Sr. Mary Margaret for comfort and counsel. 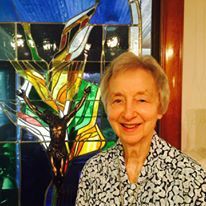 I also think that Sr. Mary Margaret, still dealing with the effects of a stroke she suffered in 2016, has a desire to put her spiritual house in good order, dealing with circumstances that shaped her life: growing up white in Decatur, IL; going to nursing school in Springfield, IL; and earning a degree from Marquette University in Milwaukee, WI. I haven’t thought much about white privilege, but I grew up in Fond du Lac, 60 miles north of Milwaukee. As I reflect on it, I had all the advantages: a stable home, a steady income, a good school, a welcoming community, and a grandmother with some money to take us traveling to California. So maybe I did belong to what Sr. Mary Margaret sought. She chose the first participants in this group of 10 that meets once a month on a Sunday afternoon. We are black and white, men and women, younger and older. We are bound by a desire to heal old wounds, make amends, and improve our awareness of the plights and problems of our brothers and sisters. Like our AA predecessors, we listen as much as we talk. What is said in the meeting stays in the meeting. Our desire is not to “fix” our colleagues but to heal ourselves – by talking honestly, listening carefully, and thinking soulfully. To one degree or another, our souls are laid bare in these meetings, sometimes with resentments from the discrimination of police officers, Christian clergy, or public officials, and sometimes with the residual guilt from our own good fortune. I recall an incident when I was a high school senior, riding around on a Friday night with a couple of guys I didn’t know very well. We pulled into a gas station, bought a couple of bucks’ worth, and before we left one of the guys lifted a tin of car wax and slipped it into his back pocket. I didn’t know about it until we were a mile away, but then I did not insist that we go back and return it. The next day a police officer appeared at my door. The station owner had matched one of the guys from a photo in a high school yearbook, and he fingered me as a ride-along. I quickly “fessed up,” and the cop gave me a five-minute lecture on the doorstep about honor and honesty. He also told my father. What he did NOT do was arrest me. I’ve heard enough stories from the black men at our meeting to know they were not afforded the same privilege I got from a cop who knew my father. I have no doubt that a black kid in my situation would have been taken downtown, written up, and saddled with a record. I got away clean, and that’s the way I entered the U.S. Army and the University of Wisconsin. That seems to me to describe white privilege. Abandon yourself to God as you understand God. Admit your faults to God and to your fellows. Clear away the wreckage of your past. Give freely of what you find and join us. We shall be with you in the fellowship of the spirit and you will surely meet some of us as you trudge the Road of Happy Destiny. Thanks to Sr. Mary Margaret, we have begun the journey. * Dave Nimmer, journalist for the Minnesota Good Age magazine, is a frequent contributor to the Visitation blog, especially in his series of profiles of Visitation Companions and North Side neighbors. We hope you enjoy these stories of the blessed community that surrounds the monastery and sustains us in our ministry of mutuality.